THE KILLING continues tonight on AMC and it is already the tenth episode of the 10th season. On tonight’s episode called, “Six Minutes” Holder wrestles with personal demons. Seward tells the truth. If you want to catch up before tonight’s episode, you can read our full and detailed recap, right here. On last week’s show the hunt for the pornographer led to a horrifying revelation and Holder looked for someone to blame. Linden and Holder sought out Joe Mills after he attacked Danette. Their pursuit proved costly to everyone. With Seward’s execution scheduled the next day, he desperately accepted Dale Shannon’s suggestion to pray, only to learn his cellblock mate’s true nature. Twitch and Lyric found their dream home. On tonight’s show we are nearing the end of season 3 with only two episodes left. In the next episode it looks like Linden goes to see Ray about the rings; asking if he recognizes any of them but the guards come and force him to leave quickly, could they be taking him to his execution? His son also mentions how he himself wasn’t the one who saw what happened but someone else referring to them as “he” I’m guessing he means his father Ray? There is so much going on now, Bullet has died and I guess Kalie is obviously dead as well; there’s only two more episodes left and I have no idea how this will all end. 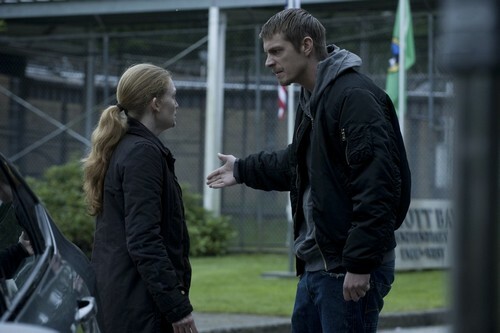 We will be live blogging The Killing Episode 10 beginning tonight at 9PM EST. so make sure to come back to this spot and watch the show with us. Make sure to refresh often so you get the most current info! While you wait for the recap, check out a sneak peek of tonight’s episode below!